So, our penultimate feature of garden nasties is possibly one of the most contentious weeds known to gardener kind – the Common Nettle. Hated by allotmenteers for their chocking love of fertile soil and by virtually everyone for their well-known sting, the Common Nettle certainly falls into the category of an undesirable weed. Or does it? Not so say some gardeners, even to the point of claiming the common nettle is a beneficial plant and one that every gardener should have in their garden. Obviously it seems there is more to this weed than might at first be apparent. Let’s have a look at the cons first. These are the obvious drawbacks to the Nettle that have placed it firmly in the minds of many people as a weed and a scoundrel. For one thing it spreads fast using surface tendrils and stems, pausing periodically to grow nodes that can stand alone as separate plants if cut off from the rest of the plant. This also makes it quite resilient to weeding since all it takes is for us to miss one node and the whole lot will start growing again, not perhaps as bad as Bindweed and Horsetail and certainly not as bad a brambles, but still pretty annoying. What makes it even more annoying is its adaptability. Nettles absolutely love cultivated and prepared soil, especially if it is rich in phosphates, which makes them the bane of many allotment and vegetable patch owner. Left to their own devices in such soil, they can rapidly grow and spread, taking nutrients, water and sunlight from the hard working veg. they were intended for. However, while Nettles will grow quickly in well prepared soil, they don’t actually need it. Nettles can thrive just about anywhere and in almost any conditions, evolutionarily speaking they are a marvel. Then of course there is the stand out reason most of us dislike nettles; they sting. Yes many a child has been dealt their first lesson in the dangers of nature while happily running through the undergrowth only to find they are suddenly surrounded by nettles and covered head to toe in stinging welts. It’s enough to make a person downright prejudiced against them, or so I’ve heard. Nevertheless, any gardener expecting there to be children running about their garden is wary of nettles, and rightly so. However! Despite the much maligned reputation of the Common Nettle, there are those that say it is a wonder plant that should be kept (including the great Titchmarsh himself!). Firstly, and still quite surprisingly to many, Nettles are edible – a favourite of my father actually. In fact they were a common source of winter nourishment throughout British history until other, more fashionable veggies became the norm. Packed with nutrients they are often regarded as a superfood to put spinach to shame. For this same reason, Nettles are one of the best plants to compost. So much so in fact, that the standard practice for doing so is no longer to simply chuck them on the compost heap but to make tea out of them. Just to clarify, this is not drinkable tea, well you’re not going to drink it at any rate. By chopping up all your dug out up Nettles and leaving them in a sealed container of water for a few weeks, you will have created one of the most effective natural fertilisers available. The resulting thick green soup is teeming with nutrients and all the goodies plants just love, making it a definite must to try out for anyone who has just weeded out a load of Nettles. Just one quick word of warning, the fragrance of the resultant gloop is somewhat unique. You can understand why the plants leap out the ground to get away from it! But wait, there’s more. If you leave the Nettles to stew for a few days instead of a few weeks, you will end up with a clearer liquid that can be used as a pesticide and pest repellent for you greenhouse. We are not the only ones who dislike the sting of the Nettle, and if you have a problem with whitefly this is valuable information. Put some of your lighter Nettle tea in a spray bottle and give the underside of any affected leave a spritzing. The mixture won’t harm the plant at all, but it will be just enough to drive off any beasties lying in wait to pinch your tomato plants. Finally, the Common Nettle is also a friend to wildlife. Several species of butterfly find the leaves of Nettles to be their favoured breeding ground, including a number of rarities. 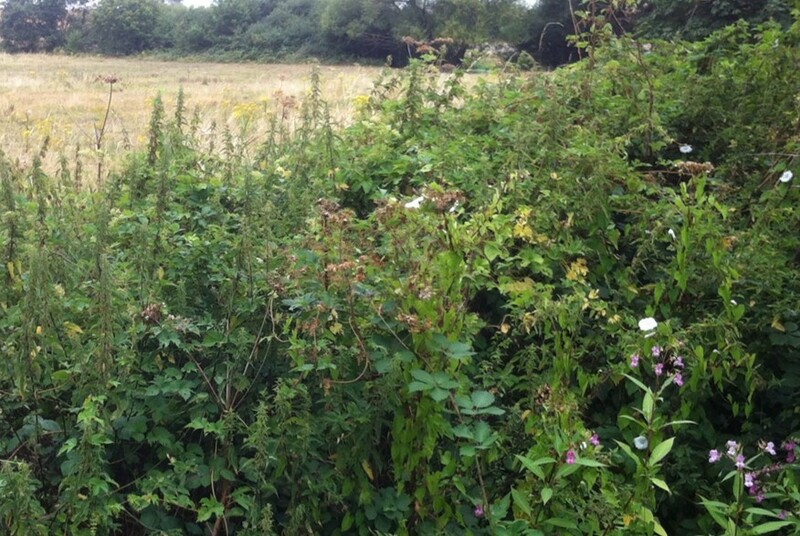 This is important, because as urban development keeps its march on out Green Belt, there are increasingly fewer habitats available for butterflies and other such creatures, so really the whole ecosystem benefits from us keeping a few Nettles around. So Nettles are not all bad. But then again they’re not exactly easy to live with either and so do need to be controlled. For the most part getting rid of Nettles is pretty simple. Unlike the other weeds we mentioned, Nettles spread via surface tendrils and stems and put down nodes rather than being one interdependent web; which simply means you can chop them up to your heart’s content. Hoeing is a great way to get controlling Nettles, just hack away at the surface plant and you should take most of the plant away with you, it will begin to grow back quite quickly but keep up the hoeing it will soon be too deprived of energy and nutrients to keep growing. You can try to dig out the nodes but this would only be truly necessary if you are about to plant a bed where the Nettles are, if you are just trying to curtail the spread, some vigilant hoeing will damage the plant enough that it won’t grow back any time soon. If you don’t want to hoe, invest in some long leather gardening gloves and haul the unwanted plants out. Just remember the baby Nettles are the most vicious. 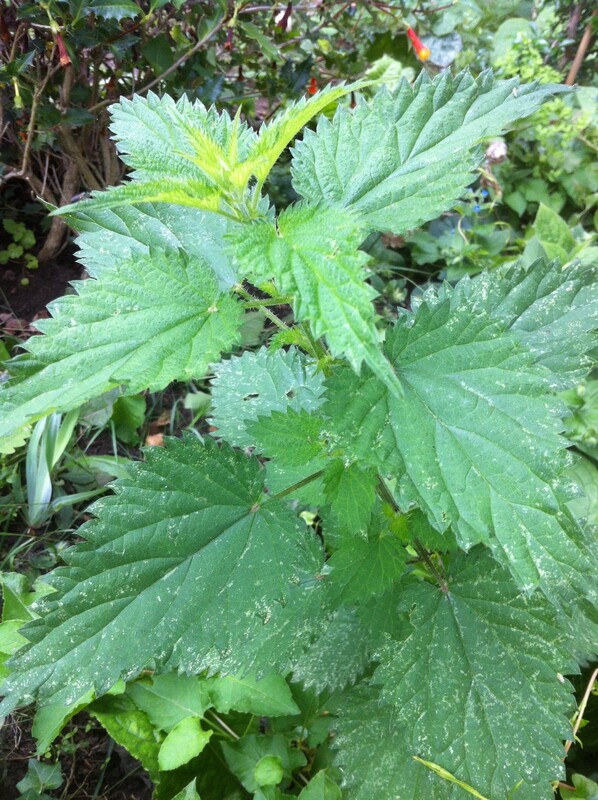 Getting stung by a emerging Nettle and you know about it! Similarly, if you have Nettles growing in your lawn, the solution couldn’t be simpler; mow them up till they don’t grow back. If you want to clear an area of Nettles completely there is always the chemical approach. Spraying a glyphosate weed killer over a Nettle infestation, especially if you do so around June when the Nettles are flowering, will kill off the weeds quite handily and make removing them a bit less hassle (but whatever you do, don’t try to make Nettle tea fertiliser with Nettles you’ve sprayed with weed killer, that would just be silly!). I really do not recommend attacking these plants with chemicals though, the other approaches are easier and softer on good old Nature. So if you have an area behind the shed or behind some shrubs that have become home to some nettles, leave them be or farm them. Nettle soup is an acquired taste but as my father said, it doesn’t half do you good.